On 15 November the Vanuatu Meteorology and Geo-hazards Department (VMGD) reported that ongoing explosions at Yasur were sometimes strong during October and November, based on visual observations and seismic data. The Alert Level remained at 2 (on a scale of 0-4). VMGD reminded residents and tourists that hazardous areas were near and around the volcanic crater, within a 395-m-radius permanent exclusion zone, and that volcanic ash and gas could reach areas impacted by trade winds. The Vanuatu Meteorology and Geo-hazards Department reported some stronger explosions at Yasur during 27-28 June. Based on webcam images the Wellington VAAC reported that on 29 June intermittent, low-level ash plumes rose to an altitude of 1.8 km (6,000 ft) a.s.l. and drifted NW. The Alert Level remained at 2 (on a scale of 0-4). VGO reminded residents and tourists that hazardous areas were near and around the volcanic crater, within a 395-m-radius permanent exclusion zone, and that volcanic ash and gas could reach areas impacted by trade winds. Based on webcam images and local visual observations the Wellington VAAC reported that during 20-21 June intermittent, low-level ash plumes from Yasur rose to an altitude of 1.5 km (5,000 ft) a.s.l. and drifted SE. Based on webcam images, satellite data, and local visual observations the Wellington VAAC reported that during 14-15 and 17-18 June intermittent, low-level ash plumes from Yasur rose to altitudes of 0.9-1.2 km (3,000-4,000 ft) a.s.l. and drifted SW, W, and N.
Based on webcam images and model data, the Wellington VAAC reported that during 5-6 June intermittent, low-level ash plumes from Yasur rose to an altitude of 1.5 km (5,000 ft) a.s.l. and drifted NW. Ash was not identified on satellite imagery. On 25 April the Vanuatu Meteorology and Geo-hazards Department (VMGD) reported that ongoing explosive activity at Yasur was confined to the crater. The Alert Level remained at 2 (on a scale of 0-4). VGO reminded residents and tourists that hazardous areas were near and around the volcanic crater, within a 395-m-radius permanent exclusion zone, and that volcanic ash and gas could reach areas impacted by trade winds. Based on visual observations and satellite data, the Vanuatu Geohazards Observatory reported on 19 March that explosions at Yasur remained strong. The Alert Level remained at 2 (on a scale of 0-4). VGO reminded residents and tourists that hazardous areas were near and around the volcanic crater, within a 395-m-radius permanent exclusion zone, and that volcanic ash and gas could reach areas impacted by trade winds. On 11 November the Vanuatu Geohazards Observatory stated that the Alert Level for Yasur remained at 2 (on a scale of 0-4) and that explosions continued to be intense. VGO reminded residents and tourists that hazardous areas were near and around the volcanic crater, within a 395-m-radius permanent exclusion zone, and that volcanic ash and gas could reach areas impacted by trade winds. On 15 October the Vanuatu Geohazards Observatory stated that the Alert Level for Yasur was raised to 3 (on a scale of 0-4), noting that explosions could become more intense. The Alert Level was lowered back to 2 on 18 October. VGO reminded residents and tourists that hazardous areas were near and around the volcanic crater, within a 600-m-radius permanent exclusion zone, and that volcanic ash and gas could reach areas impacted by trade winds. On 10 October the Vanuatu Geohazards Observatory stated that the Alert Level for Yasur remained at 2 (on a scale of 0-4) and that explosions continued to be intense. VGO reminded residents and tourists that hazardous areas were near and around the volcanic crater, within a 600-m-radius permanent exclusion zone, and that volcanic ash and gas could reach areas impacted by trade winds. On 9 September the Vanuatu Geohazards Observatory stated that the Alert Level for Yasur remained at 2 (on a scale of 0-4) and that explosions continued to be intense. VGO reminded residents and tourists that hazardous areas were near and around the volcanic crater, within a 600-m-radius permanent exclusion zone, and that volcanic ash and gas could reach areas impacted by trade winds. On 2 August the Vanuatu Geohazards Observatory stated that the Alert Level for Yasur remained at 2 (on a scale of 0-4) and that explosions continued to be intense. VGO reminded residents and tourists that hazardous areas were near and around the volcanic crater, within a 600-m-radius permanent exclusion zone, and that volcanic ash and gas could reach areas impacted by trade winds. On 28 June the Vanuatu Geohazards Observatory stated that the Alert Level for Yasur remained at 2 (on a scale of 0-4) and that explosions continued to be intense. VGO reminded residents and tourists that hazardous areas were near and around the volcanic crater, and that volcanic ash and gas could reach areas impacted by trade winds. On 27 May the Vanuatu Geohazards Observatory stated that the Alert Level for Yasur remained at 2 (on a scale of 0-4) and that explosions continued to be intense. VGO reminded residents and tourists that hazardous areas were near and around the volcanic crater, and that volcanic ash and gas could reach areas impacted by trade winds. On 31 March, the Vanuatu Geohazards Observatory stated that the Alert Level for Yasur remained at 2 (on a scale of 0-4) and that explosions were intense. VGO reminded residents and tourists that hazardous areas were near and around the volcanic crater, and that volcanic ash and gas could reach areas impacted by trade winds. On 14 January, the Vanuatu Geohazards Observatory stated that the Alert Level for Yasur remained at 2 (on a scale of 0-4) and that explosions had become more intense. VGO reminded residents and tourists that hazardous areas were near and around the volcanic crater, and that volcanic ash and gas could reach areas impacted by trade winds. On 15 December, the Vanuatu Geohazards Observatory stated that the Alert Level for Yasur remained at 2 (on a scale of 0-4) and that explosions had become more intense. VGO reminded residents and tourists that hazardous areas were near and around the volcanic crater, and that volcanic ash and gas could reach areas impacted by trade winds. On 13 November, the Vanuatu Geohazards Observatory stated that activity at Yasur had increased with more intense explosions. The Alert Level was raised to 2 (on a scale of 0-4). VGO reminded residents and tourists that hazardous areas were near and around the volcanic crater, and that volcanic ash and gas could reach areas impacted by trade winds. On 27 April, the Vanuatu Geohazards Observatory stated that Yasur continued in a state of unrest; the Alert Level remained at 1 (on a scale of 0-4). VGO reminded residents and tourists that hazardous areas were in proximity to and around the volcanic crater, and in volcanic ash and gas prone areas exposed to trade winds. On 7 April, the Vanuatu Geohazards Observatory reported that explosive activity from Yasur had increased beginning on 2 April; explosions had become stronger and more frequent. Bombs fell around the summit area, the tourist walk, and the parking area. Moderate ash venting occurred on 2, 4, and 5 April, and possibly continued. The Alert Level was lowered to 2 (on a scale of 0-4). On 13 June, the Vanuatu Geohazards Observatory reported that activity from Yasur decreased during the previous week after a brief period of high activity with significant explosions and ashfall. Even though Strombolian activity occasionally ejected bombs that fell around the crater, explosions had become slightly weaker and less frequent. The Alert Level was lowered to 2 (on a scale of 0-4). On 1 June, the Vanuatu Geohazards Observatory raised the Alert Level for Yasur to 3 (on a scale of 0-4) following increasing explosive activity during May. Access to the volcano was closed and a 500-m zone around the volcano was restricted. The Geohazards team noted strong explosions from all three active vents along with ash emissions and bomb ejections during 31 May-3 June. Bombs fell around the crater rim and explosions were heard and observed from nearby villages. On 12 May, the Vanuatu Geohazards Observatory reported that, based on information collected by the Vanuatu Meteorology and Geohazards Department, satellite imagery showed strong degassing from Yasur during the previous week. Residents living close to the volcano reported persistent strong explosions that were heard and felt on 12 May. The Vanuatu Volcano Alert Level (VVAL) remained at 2 (on a scale of 0-4). The Vanuatu Geohazards Observatory reported that the Vanuatu Volcano Alert Level (VVAL) for Yasur was increased to 3 (on a scale of 0-4) on 27 May. Recent activity was characterized by moderate to large eruptions with strong explosions, ejected bombs that fell on the visitor viewing area, and significant ashfall in nearby villages. Visitors were not allowed to enter a restricted zone, within about 500 m around the volcano. Activity had been escalating since January 2010. According to a news article, an eruption plume on 1 June rose to an altitude of 1.8 km (6,000 ft) a.s.l. and spread over 340 square kilometers, canceling or delaying some flights in and out of New Caledonia (about 430 km WSW). On 11 May the Vanuatu Geohazards Observatory reported that, following an assessment of Yasur during 26-27 April, activity from the volcano remained high. Strong degassing and ash emissions from all three active vents were noted. Ash fell on the E and W parts of the island. New bombs were deposited around the crater rim and in areas near the vents. Explosions were heard and seen from surrounding villages. Satellite imagery and seismic data confirmed strong degassing and explosive activity. The Vanuatu Volcano Alert Level (VVAL) remained at 2 (on a scale of 0-4). On 12 March, Vanuatu Geohazards Observatory reported that thermal anomalies from Yasur were detected in satellite imagery during 8 December 2009-8 March 2010. They also noted an increase in activity since January 2010. Satellite images from 21 January showed significant sulfur dioxide gas emissions. Bombs were ejected sometime during the week of 1 March. Observations on 8 March and analyses of seismic data also indicated increased activity, and all three vents were active. The Vanuatu Volcano Alert Level (VVAL) was raised to 2 (on a scale of 0-4). Based on a pilot observation, the Wellington VAAC reported that an ash plume from Yasur rose to an altitude of 4 km (13,000 ft) a.s.l. and drifted SE. Ash was not identified on satellite imagery. According to a report from John Seach, eruptive activity at Yasur continued at "normal" levels during March, with an average of 500 explosions occurring per day. An increase in activity at Yasur since October 2001 and the occurrence of a M 6 volcanic earthquake on 29 August at 1500 led scientists to increase the Alarm Level at Yasur to 3. This was the largest earthquake recorded at Yasur since seismic stations were installed in October 1992. Access to the volcano was prohibited and no evacuations were ordered. An eruption occurred at Yasur on 25 January around 1300. A pilot reported that an ash cloud rose ~2 km a.s.l. and slowly drifted S. The ash cloud was not visible on satellite imagery, possibly due to heavy meteorological cloud cover. Scientists were on alert for heightened volcanic activity at Yasur following a M 7.2 earthquake on 3 January at 0430 near Vanuatu. The earthquake produced landslides in Vanuatu's capital, Port Vila, and damaged buildings and bridges in the city, but there were no deaths or serious injuries. During 5 January to at least 16 January Yasur was active with ash falling on the population of Tanna Island, polluting water sources. The week of 6 January the Vanuatu government restricted access to the volcano's crater citing an increased risk of a large eruption since the 3 January earthquake. Authorities are prepared to evacuate residents from near the volcano if a large eruption occurs. "[On 4 March] there were three aligned craters, perhaps 300 m apart . . ., heavy fumarolic activity occurred from the northernmost crater. Frequent noisy Strombolian activity ejected tephra to heights of tens of meters from the other two craters. Tephra did not rise above the volcano's summit." ". . . The gas and ash plume discharged from the volcano is carried by the prevailing SE trade winds across the central parts of the island. During 1987 and 1988, vegetation in areas downwind from the volcano has been affected by gas, ash, and acid rain from the plume, causing damage to residents' gardens and coffee plantings in the centre of the island. The volcanic damage added to and accentuated that caused by a succession of three cyclones in 1987-88. Werner Giggenbach, Ian Nairn, and Bradley Scott of the New Zealand DSIR visited Tanna for two weeks in September 1988. The investigation was coordinated and funded by the New Zealand Ministry of Foreign Affairs. "Although frequently visited by tourists, eruptive activity at Yasur has not been studied in detail since a 1959 seismic study by Blot and Tazieff. Activity between 1959 and 1978 was briefly described by Carney and Macfarlane (New Hebrides Government Geological Survey Regional Report, 1979). "Explosive eruptions were frequent at Yasur during our 6-14 September observation period, with four vents active in the three main subcraters, and continuous steam emission from a 5th vent high on the W crater wall. This steam vent had formed since the last available aerial photography in September 1986. A gas plume was continuously emitted from a small active lava lake in the central subcrater, with intermittent gas discharges during explosive eruptions from the other three vents. All these gas discharges combined to produce a continuous and voluminous gas plume that extended downwind from the volcano. Discussions with local people, observations made by tourists in past years, and comparisons with published and unpublished photographs have indicated that eruptive activity was at a relatively high level during our inspection, probably with more frequent explosions from more active vents than was usual prior to 1987. The volcanic plume also now appears to be larger and more constant than typical of earlier dry seasons. "Eruption observations (including video camera recordings) correlated with our seismic recordings have enabled the seismicity to be used as a continuous record of eruptive activity, and provide the only quantitative data on comparative activity and gas discharge. During an inspection in April-May 1959, Blot and Tazieff recorded an average of 5 explosion earthquakes/hour, at a time when Yasur was fairly quiet. During our September 1988 observations, an average rate of 21.5 explosion earthquakes/hour was recorded. Each explosion results from the discharge of volcanic gas, while the high level of recorded volcanic tremor is correlated with the continuous gas discharge through the lava lake. We infer that the gas discharge was considerably higher in September 1988 than in 1959. Many of the explosions occurred as sharp detonations, often preceded by 'flashing arcs' (atmospheric shock waves) visible in the steam and gas haze within the crater, and felt as a sharp slap by observers on the crater rim. "The present subcraters are deep (estimated at ~250 m below the S crater rim by parallax bar heighting of aerial photographs, and angle/distance measurements to the central lava lake) with near-vertical walls. Although the most violent explosions threw bombs high above the crater rim, these were on near-vertical trajectories, so that nearly all the bombs fell back into the crater. "During earlier periods of increased eruptive activity, such as in 1975, many bombs were thrown over the crater rim, probably due to a shallower and more gently sloping crater configuration. The frequent explosions now occurring may also be less violent due to greater gas discharge and magma convection rates maintaining higher temperatures, and thus lower viscosities and yield strengths in the uppermost parts of the magma columns. The only bomb observed to be thrown over the crater rim was sampled while still hot, and has a composition similar to that of bombs ejected in 1934 and 1975. This suggests that no major change in magma composition has accompanied the recent volcanic gas damage problems. "Gas samples collected from the plume crossing Yasur crater rim contained SO2 and HCl gases at concentrations between 3 and 9 ppm. The mass discharge rate of volcanic gases was not measured but our visual comparison of plume size with other volcanoes suggests that the Yasur discharge rate was between 400 and 800 tons/day SO2. This output and gas composition are typical of other volcanoes around the Pacific rim. SO2 and HCl are removed from volcanic plumes by rainout of condensing steam within the plume, rainfall through the plume, and adsorbed onto ash falling from the plume. Studies elsewhere have shown that damage to vegetation is most likely to have resulted from acids dissolved in water, most effectively applied to foliage as light rain or mist and accentuated by the presence of fine ash particles. These mechanisms appear to have caused the vegetation damage. "Radiocarbon samples collected from Yasur pyroclastic fall deposits downwind . . . suggest that . . . continuous small-scale Strombolian activity has been in progress for the last 800 years, with at least two discrete subplinian scoria fall eruptions occurring between 1,400 and 800 years BP." References. Blot, C., Chaigneau, M., and Tazieff, H., 1960, Nouvelles-Hebrides (Mars-Mai 1959): BV, v. 23, p. 207-210. Geology of Tanna, Aneityum, Futuna and Aniwa. 1978: 1:100,000 New Hebrides Geological Survey Sheet 11. Information Contacts: I. Nairn, NZGS Rotorua. Volcanic activity, consisting of block and ash emissions, and bubbling lava lakes, seemed slightly decreased since visits during 1988. The configuration of the main crater and its three principal sub-craters (A,B,C; figure 1) remained relatively unchanged. The depth from the summit to the base of the crater was estimated at >350 m, placing activity at or below sea level. Figure 1. Sketch map of Yasur showing the locations of the principal craters and sub-craters (from Nairn and others, 1988). In sub-crater A, a new lava lake (~20-25 m in length) was visible; strong turbulence in the lake due to rising gas bubbles caused lava to move N-S. Explosions at other vents (notably one in the S part of sub-crater B) corresponded with increased intensity of lava lake activity. Two other vents in sub-crater A had explosions that ejected ash and incandescent blocks. The blocks had loud detonations on impact. Projectiles and night glow were visible from a lava lake in sub-crater B, hidden from view by a ridge. Explosions were identified from at least three vents, with frequencies of 1 explosion/5 minutes to 1/hour. Sub-crater C was less active, occasionally emitting puffs of ash or gas following explosions in sub-crater B. There were no visible shock waves or ejecta being deposited outside of the crater, as there were in 1988, suggesting a decrease in the intensity of activity. Concentrations of 5-10 ppm SO2 were measured in the plume, 1 ppm from the ash plain below the plume, and 0.5 ppm, 3 km from the volcano. The SO2 flux was estimated to be 1,200 ± 600 t/d, based on the measured concentrations and a visual estimate of the plume volume. This is greater than the flux usually registered at other volcanoes in the Vanuatu arc (100-600 t/d). During 1987-88, vegetation in areas downwind from the volcano was affected by gas, ash, and acid rain, causing damage to gardens and coffee plantings. Reference. Nairn, I.A., Scott, B.J., and Giggenbach, W.F., 1988, Yasur volcano investigations, Vanuatu, Sept. 1988: New Zealand Geological Survey Report, no. G134, 74 p.
Further Reference. Eissen, J.P., Monzier, M., Robin, C., Picard, C., and Douglas, C., 1990, Report on the volcanological field work on Ambrym and Tanna Islands (Vanuatu) from 2 to 25 September 1990: Rapport Missions Sci Terre Geologie-Geophysique - ORSTOM (Noumea), no. 22, p. 1-22. "Activity remained unchanged during 1990-91, with block and ash emissions and small episodic lava lakes." The following is from a report by Gérard Granger on activity observed from the summit's main crater rim on 17 and 18 August (LAVE Bulletin, no. 34, Paris, France, p. 2-3). Active lava lakes and/or Strombolian activity were visible at four vents (A, B, B', and B''; figure 2) within the large pit crater located at the center of the main crater. The fifth summit vent (C), NE of the central pit crater, appeared inactive. Figure 2. Sketch map of the summit of Yasur, 17-18 August 1991. Courtesy of G. Granger. Vent A is located within a deep cylindrical pit, with a 100-m-high nearly vertical S wall. Although the lava surface was not visible, continuous lava fountaining ejected material several meters above the rim. Rare explosions (two on 17 August during 9 hours of observations, and one during 6 hours the next day) threw lava clots 50-80 m above the rim. Strombolian activity occurred at a small ash cone (vent B), just below the E rim of the central pit crater. Several tens of explosions occurred/hour, occasionally with 7-8 explosions in rapid succession. The narrow eruptive plume rose above the rim of the main summit crater, obscuring the view of vents B' and B'' from the SW rim (point N). Located within a cinder cone at the NW base of the central pit-crater wall, the 10-m-wide vent B' was the site of the most intense activity. On 17 August, a small, continuously bubbling lava lake was periodically visible within the cone. By the following day, the surface level of the lake had dropped, and it was no longer visible. Approximately one explosion was heard/second, accompanied by ejections of fluid lava. Several (usually ~10) times/hour, a large explosion sent a fountain to 100 m height. Vent B'' is located within a continuously incandescent crater, 80 m below the top of the NE wall of the central pit crater, where it joins crater C. Loud explosions occurred at a rate of 3 or 4/hour, dropping ballistics onto the pit crater rim. Large quantities of ash were emitted following the explosions. Information Contacts: G. Granger, LAVE. Observations from the W part of the crater rim on 28 October 1992 revealed low-level activity in Zone A, (S section of the crater) and substantial gas emission with faint explosions in Zone B (central section). Significant activity was observed in Zone C (N section) with large explosions and lava ejections reaching the rim. Explosions were heavily ash-laden and an ash cloud was clearly visible from the NW side of the volcano. Steam emission decreased through October because of low rainfall. A total of 21 earthquakes were recorded in 3 hours during 28 October fieldwork. The surface area of Lake Siwi had retreated by about one-third since the beginning of October and the river which feeds it had dried up. On 8 November no significant explosive activity was observed. Small explosions with white gas emissions were observed in Zone A. No activity was observed in Zone B. There were heavy ash-laden gas emissions in Zone C. A continuous loud noise was heard from one of the vents, possibly in Zone C, which appeared to act as an escape valve, perhaps explaining the lack of significant explosive activity. Explosive activity resumed on 10 and 11 November, but was much less frequent and intense than in April, May, and October. Information Contacts: M. Lardy and D. Charley, LAVE. During October 1993, a telemetered surveillance station registered variations in the seismicity at Yasur. The station is located 2 km from the crater on the ashflow plain (figure 3). Seismicity (detected at five stations) generally increased from October 1993 to January 1994, corresponding to renewed eruptive activity. Very strong activity from January 1994 to January 1995 (comparable to 1976-77) ejected bombs in a radius of ~400 m from the crater rim (figure 4). Ashfall measured at the surveillance station totaled ~12 cm during January-October 1994. Seismicity remained high throughout 1994, then declined after January 1995. Figure 3. Photograph of an explosion at Yasur on 17 March 1994. The ARGOS-linked monitoring station is in the foreground. View is approximately to the W. Photo by M. Lardy, courtesy of ORSTOM. Figure 4. Sketch map of Yasur showing the area of volcanic bomb fallout during 1994. Courtesy of ORSTOM. Because Yasur is very accessible, it has been promoted as a tourist destination, resulting in a greater number of visitors and greater risk of accidents. In mid-January 1994 and early February 1995, when activity began to decline, there were two accidents with three victims. In one incident, two visitors on the crater rim died when they were struck by a 15 kg bomb ejected from the vent. Although there is little danger when the volcano is having regular explosions at intervals of a few minutes to tens of minutes, the local authorities want to better inform visitors of the constant danger. In January 1994, ORSTOM began publishing a series of booklets to inform the general public of the volcanic risks. Risks discussed include bombs falling near the crater, modifications of the crater topography (raising of the floor, migration of the vent, etc.). In addition, the 200-m distance between the observation site and the active vents, and the very frequent bomb ejections at speeds of 100-300 m/second that have rendered approaching the crater rim dangerous. Information Contacts: M. Lardy and D. Charley, Centre ORSTOM, Port Vila, Vanuatu, and Department des Mines et de la Geologie et des Ressources en Eaux; J. Tabbagh, Centre de Teleobservation Informatise des Volcans, Garchy, France; J-P. Eissen, Centre ORSTOM de Brest, France; C. Robin and M. Monzier, Centre ORSTOM, Quito, Ecuador. The very intense activity recorded throughout 1994 (BGVN 20:08) decreased in 1995. Observations during a visit on 7 November 1995 showed that the volcano had returned to a "normal" level of activity, consisting of explosions, lava fountaining, and ash emissions. Approaching Yasur is always dangerous because the trajectories of volcanic bombs are unpredictable; acoustic and optical measurements have revealed that some bombs have initial ejection velocities of ~150 m/second. A permanent telemetered seismic monitoring station located 2 km from the summit has been in operation since 1993. The majority of recorded signals correspond directly to volcanic explosions. High seismicity corresponding to the elevated level of volcanism during 1994 (figure 5) decreased throughout 1995. Figure 5. Daily seismicity at Yasur recorded by the seismometer 2 km from the summit, 1994-95. The upper line shows all events with a seismograph displacement greater than 12 µm. The bars indicate the number of larger events, those with a displacement greater than 60 µm. Note that the scale is logarithmic. Courtesy of ORSTOM. Information Contacts: M. Lardy and D. Charley, Centre ORSTOM, BP 76, Port Vila, Vanuatu, and Départment des Mines et de la Géologie et des Ressources en Eaux; J. Tabbagh, Centre de Téléobservation Informatisé des Volcans, CNRS-CRG, Garchy, France; S. Vergniolle, Institut de Physique du Globe, Paris, France; J-P. Eissen, Centre ORSTOM de Brest, BP 70, 29280 Plouzane, France; C. Robin and M. Monzier, Centre ORSTOM, Apartado 17-11-6596, Quito, Ecuador. Although very intense activity was recorded during 1994, volcanism decreased in 1995 and was at normal levels (explosions, lava fountaining, and ash emissions) in November 1995. After a period of significant increase in the number and intensity of explosions during June 1996, activity returned to a quieter, but sustained, level (figure 6). Figure 6. Seismicity at Yasur recorded every 4 hours by the seismometer 2 km from the summit, 24 May-23 July 1996. The upper line shows all events with a seismograph displacement greater than 12 µm. The vertical bars on the bottom of the graph indicate the number of larger events, those with a displacement greater than 60 µm. Thick lines are an 8-measurement (32-hour) running mean. Note that the scale is logarithmic. Courtesy of ORSTOM. Observations made during 3-5 July showed that explosive Strombolian activity was fairly significant. Heavy ash-and-steam plumes, visible from surrounding villages, frequently rose several hundreds of meters above the volcano, accompanied by loud rumbling/roaring noises. The summit crater is ~250 m deep, and is occupied by three smaller active craters (figure 7). During observation the explosive activity and intense degassing came from six vents (one in Crater A; three in Crater B; two in Crater C). Figure 7. Sketch map showing the summit craters at Yasur, 3-5 July 1996. Observation points are indicated by an "X". Courtesy of Henry Gaudru, SVE. Crater A was a pit with a S vertical wall ~100 m high. On the morning of 3 July between 1130 and 1330 the activity was principally characterized by frequent and intermittent explosions that generated ejections of magma fragments to several dozens of meters above the vent, sometimes surpassing the upper rim of the crater. A steam-and-ash plume regularly followed the explosive activity. Crater B, smaller than A and separated from it by a small wall, had more sustained explosive activity from several vents, of which two (B1-B2) were particularly active with strong degassing. Bombs were regularly ejected >300 m vertically, often surpassing the highest point on the crater rim. The most active vent (B1) showed activity phases of continuous, very violent jets that lasted between 1 and 5 minutes, notably between 1930 and 2230 on 3 July. Pressurized gas intermittently generated a blue-orange flame. Good-sized magma fragments projected several meters above this vent were accompanied by strong detonations and intense degassing. Based on calculations made following several hours of observations, the ejection speed was estimated at 230-250 m/second. A third vent (B3) near the E rim was also very active but in a less violent and frequent manner. Two other vents, more westward, visible for an instant, showed mainly intense degassing sometimes accompanied by magma ejections to some meters above the red glow. Crater C is a large depression with a lava lake in its center, usually agitated by surface movements. Violent explosions sent heavy gray-black ash plumes several hundreds of meters above the crater. Weak magma ejections also occurred from a glowing zone SW of the main lava lake. On the night of 3-4 July an intermittent flame came from the interior of this pit. Several times during the night, Strombolian explosions occurred simultaneously in these two areas. A count of magma-ejecting explosions made over three 1-hour periods showed that Crater B was consistently more active. On 3 July between 1800 and 1900 a total of 63 explosions were distributed as follows: Crater A, 10; Crater B, 33; Crater C, 20. On 3 July between 2030 and 2130 a total of 51 explosions were distributed as follows: Crater A, 8; Crater B, 26; Crater C, 17. On 4 July between 1000 and 1100 a total of 54 explosions were distributed as follows: Crater A, 10; Crater B, 28; Crater C, 16. On 5 July between 1430 and 1600, activity was much less frequent than the previous days, with explosions followed by long minutes of silence. The lava lake was quite visible in Crater C. During this period craters A and C were more active than B. At 1545 a larger explosion from Crater B generated some bomb falls at the extreme edge of the crater. 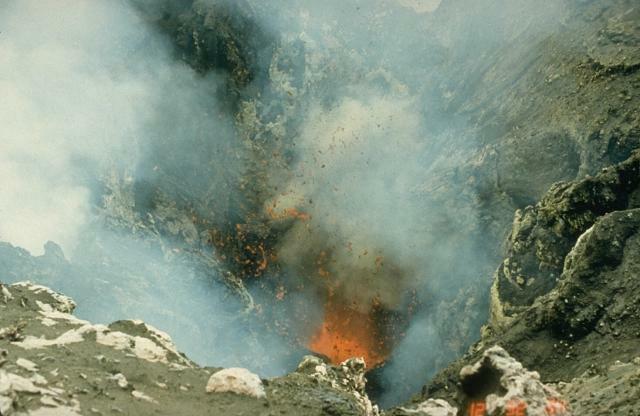 On 13 August 1997, Steve O'Meara and Robert Benward climbed Yasur from the NE (the Sulphur Bay side); they camped for two evenings on the volcano's summit at the E lip of the main crater (figures 8, 9, and 10). On 16 and 17 August they hiked on the S side of the volcano up to 150 m from the summit where they watched the eruptions for two hours each night. They shot video footage of dramatic, night-time intracrater activity abundant molten bombs hurling inside the crater, with many sticking to the steep crater walls. Reported explosion heights were determined by timing the fall of a fragment from the apex of its curve and using the equation x = 1/2 gt2. Figure 8. Photograph of Yasur showing a dual ash eruption from the S and N craters; sunset, 13 August 1997. View is from the E. Courtesy of Stephen and Donna O'Meara. Figure 9. Photograph of Yasur showing a thin 150-m-high explosion in the N crater; early morning, 14 August 1997. View is from the E along the Jupiter trail. Courtesy of Stephen and Donna O'Meara. Figure 10. Photograph of Yasur showing a wide-angle view of the summit with Strombolian activity in the N crater; dusk, 14 August 1997. View is from the E. Courtesy of Stephen and Donna O'Meara. The interior of the crater sloped sharply inward to a depth of ~70 m, where it intercepted a broad platform of ash punctuated by two roughly equally sized, oval-shaped craters, each ~70 m in diameter and 70 m deep. The craters were aligned N-S, and separated by an E-W trending ridge of ash. Each crater had three erupting vents. North Crater observations. The active vent on the far E floor continuously spewed lava fragments 10-20 m high with coughing and splashing sounds. Occasionally a web-like bubble of lava rose out of the vent and burst as it expanded. Small puffs of steam and ash accompanied some of the more forceful discharges of gas. Several times during 13-15 August Strombolian explosions shot lava fragments 100-170 m into the air. One of the strongest explosions, on 15 August, directed ENE, showered the summit with volcanic bombs. One football- sized bomb fell ~30 m from the observers who collected it and donated it to the Smithsonian Institution. This explosion was followed by a sequence of blasts at intervals varying between 15 minutes and a few hours. As a qualitative measure of the explosions' intensity the observers reported that some of the strongest ones shook the ground, and they could feel the shock waves pound against their chests. Two other vents were located on the SE and SW parts of the crater floor. These issued sporadic, small columns of ash rising to heights of ~100 m before dispersing in the high winds at the summit. On the night of 16 August the N crater was still continuously spattering. The following night two blasts threw fragments ~200 m above the crater. South Crater observations. This crater produced ash clouds from three vents, (two in the E- central section and one on the W side of the crater's floor). On 13 August the emissions were almost continuous; the central vents appeared to be filled with ash and the eruptions started as a boiling up of ash that sent ripples out from the center. As the ash column formed, a shower of incandescent rocks rose within it to a height of ~15 m before the fragments rained back down into the vent. In general these eruptions were relatively silent, sounding like sand being dumped from a truck, followed by the thudding of rocks as they hit the ground. Distinct snapping sounds occurred ~ 2 seconds after the incandescent rocks began rushing up the ash column, possibly due to static discharge. Within the next 24 hours the W vent became gradually less active, and the two central vents merged into a single larger vent. During the two observation periods on 16 and 17 August the S crater was extremely active with explosions every 10 to 15 minutes. The sounds rivaled those of the strong Strombolian explosions from the N crater. Information Contacts: Stephen O'Meara, Donna O'Meara, and Robert Benward, Volcano Watch International, Nature *Stock, PO Box 218, Volcano, HI 96785, USA. ORSTOM reported in late November that there has been little change in the appearance of Yasur's crater since February 1997. During this interval only craters B and C (figure 11) were active; crater A was quiet. Crater B produced a few explosions and small ash plumes; occasionally small lava bombs (a few tens of centimeter in diameter) reached the lip of the crater. Figure 11. Sketch of the summit crater area at Yasur. Labels A, B, and C correspond to named craters. The sketch was based on photographs taken on 28 February 1997. Drawn by Alfreda Mabonlala; provided courtesy of P. Gineste, ORSTOM. Seismic signals in 1997 (figure 12), with frequencies of 1-7 Hz, were related to Strombolian explosions and correlated with surface phenomena (Nabyl and others, 1997). All signals were recorded 2 km from the crater (figure 13), relayed to an ARGOS satellite, and then to the receiving station. Regional seismicity accounted for a small percentage of signals and thus had negligible effect on event counts. Figure 12. Daily seismicity and smoothed average seismicity recorded at Yasur during January through early November 1997. The solid line depicts smoothed averages of 25 recording periods; the averages were made to the number of events with vertical displacements reaching over 12 µm. The histogram shows the number of events with vertical displacements over 60 µm; these stronger events were absent during October and early November 1997. Such quiet intervals were common during early 1996 and much of 1995. Courtesy of ORSTOM. Figure 13. The ARGOS-linked monitoring station with Yasur to the N in the background, 2 November 1997. Courtesy of Pascal Gineste, ORSTOM. Continuous seismic monitoring since March 1997 (figure 12) revealed a general decrease in Strombolian activity over time. Still, some powerful explosions were recorded during August 1997 (BGVN 22:08). These powerful events occurred only a few times per day and had vertical displacements greater than 60 µm; their scarcity was taken as a further indication of decreased activity. Since October 1993, seismic monitors recorded periods of high activity during December 1993-March 1995 and during May 1996-April 1997; slightly elevated activity occurred during August-October 1995. It was also reported by ORSTOM that an undisclosed radiometric technique suggested that fresh magma entered the system in May 1996. 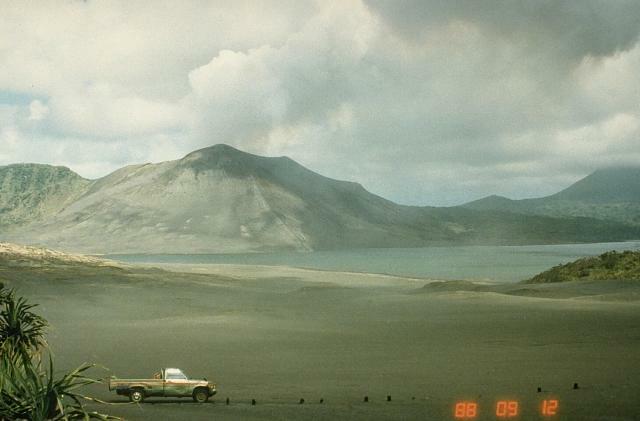 During 29 July-4 August 1997 a team from the Soci't' de Volcanologie GenŠve (SVG) visited Yasur and made visual and other observations, including some temperature estimates of lavas using an optical pyrometer. The team saw small but almost continuous Strombolian activity in the N vents area. The continuous activity was interrupted by stronger explosions every 1-1.5 hours; the explosions threw lava fragments in all directions. The fragments fell mainly inside the crater but sometimes fell on the NE part of the outside rim; in one instance, a bomb ~1 m in diameter was found still hot on the rim. The stronger phases of the eruption were accompanied by ground vibrations. Small convulsing ash clouds sometimes issued from another part of the vent area, indicating that at least two separate vents were active. At the S vents area, the SVG team observed gas, ash, and old material suddenly and noisily emitting from different vents during the beginning of their visit; a few to no red lava fragments were projected during these emissions. The activity sounded like a jet engine and caused gases to ignite. Towards the end of their visit, the team observed that the quantity of ash emitted had increased; the eruptions created ash clouds that were easily seen from the volcano's foot. The SVG team measured temperatures with an infrared (1.55 µm wavelength) optical pyrometer (Optix-G, Keller GMBH., Ibbenburen-Lagenbeck). At an opening in the N vents area, a maximum temperature of 581°C was obtained on a weakly incandescent area. Strong degassing was present around the target at the time of the measurement (2 August). Figure 14. Photograph of Yasur looking N on 2 November 1997. Courtesy of Pascal Gineste, ORSTOM. Figure 15. Photograph looking N towards Yasur with a dry lake bed in the foreground, 2 November 1997. In 1975 there was a landslide of 50,000 m3 of material, leaving a detachment scar 100 m wide that can be seen in this photo. Courtesy of Pascal Gineste, ORSTOM. Figure 16. Photograph looking S at the crater rim of Yasur during a period of quiet activity, 2 November 1997. Courtesy of Pascal Gineste, ORSTOM. Reference. Nabyl, A., J. Dorel, and M. Lardy, 1997, A comparative study of low frequency seismic signals recorded at Stromboli (Italy) and Yasur (Vanuatu), New Zealand Journal of Geol. and Geophys. (December issue). Information Contacts: M. Lardy, D. Charley, and P. Gineste, Centre ORSTOM, BP 76, Port Vila, Vanuatu, and Départment des Mines et de la Géologie et des Resources en Eaux; J. Tabbagh, Centre de Téléobservation Informatisé des Volcans, CNRS-CRG, Garchy, France; A. Nabyl and J. Dorel, OPG, Centre de recherches volcaniques (CRV), Clermont Ferrand, France; Mf. le Cloarec, Centre des faibles radioactivités CFR, Gif sur Yvette, France; P. Vetch and S. Haefeli, Société de Volcanologie Genève (SVG), C.P. 298, CH-1225, Chene-bourg, Switzerland. On 9 September 1998, an earthquake was felt in a village 3 km from Yasur; simultaneously, loud explosions were heard from the volcano. When the summit was visited by John Seach during 10-11 September, five craters inside the main summit crater in the pyroclastic cone were found to be active. Crater A, large and on the S, displayed quiet explosions followed by brown ash emission. Other craters were quiet with only gas emissions. These included the smaller Crater B, in the center of the main crater; the larger Crater C, on the N; the small Crater D located W of Crater B; and Crater E, on the SW wall of the main crater. During 4 hours of observation on 10 September, 51 explosions were observed from four craters: Crater A, 25 explosions; Crater B, 9; Crater C, 13; and Crater D, 4. Bombs thrown from Craters B, C, and D fell back into the vent or onto the crater wall. Some larger explosions, every 20-30 minutes, threw bombs 350 m high. During the night, bombs thrown onto the crater wall glowed for up to 6 minutes. The explosions and shaking were felt up to 3 km away. A fresh bomb collected in August 1997 (BGVN 22:08) was recently analyzed by microprobe (table 1). Table 1. Major element analysis of Yasur glass taken from an average of five analyses on fresh glass bomb collected in August 1997. All iron is shown as FeO. Microprobe analysis courtesy of Timothy O'Hearn; sample courtesy of Steve and Donna O'Meara, and Robert Benward. Information Contacts: John Seach, P.O. Box 16, Chatsworth Island, N.S.W. 2469, Australia; Tim O'Hearn, Department of Mineral Sciences, Smithsonian Institution, Washington, DC 20560-0119 USA. Five years of seismic monitoring at Yasur (figure 17) suggests cycles of several months duration. Long periods of vigorous Strombolian and associated seismic activity have been followed by shorter periods of lower activity. Specifically, as seen in the upper part of figure 17, more vigorous eruptions and seismic activity prevailed from January 1994 to February 1995; this was followed by a sustained period of lower intensity activity during April-August 1995. More vigorous Strombolian eruptions and seismicity returned during May 1996-June 1997; this was followed by a quieter period during July-December 1997 (middle part of figure 17). Next, intense eruptive and seismic activity again prevailed during January-May 1998 (bottom part of figure 17); limited explosive behavior occurred from June 1998 to May 1999. The latter interval included the explosions seen during 9-10 September 1998 (BGVN 23:09), events that in the broad overview of Yasur's behavior ranked as comparatively modest. Figure 17. Daily seismicity recorded 2 km from Yasur during January 1994 through October 1998. The lines represent total counts for events with seismograph displacements greater than 12.5 µm; note that the lines are plotted on a logarithmic vertical scale. Data after October 1998 were not available. Courtesy of IRD. A large bomb ejected during January 1998 landed in a relatively flat spot more than 300 m from the crater's E rim (figure 18, bold star). Figure 19 shows a photo of the bomb and its impact crater taken after the bomb cooled. The bomb's size and the distance from the crater attests to the danger of approaching the vents and working on the volcano. Figure 18. A topographic map of Yasur's crater and vicinity (N Tanna Island) showing the point where a large bomb struck (bold star to E of crater) in January-February 1998. Contours indicate elevations in meters (20 m contour interval). The sea lies on the map's upper right corner. Courtesy of Michel Lardy, IRD. Figure 19. Bomb ejected from Yasur found ~ 300 m from the E rim. The photograph was taken in January 1998. Courtesy IRD. An artist's rendering (figure 20) depicts the crater configuration in March 1998; this morphology was established following the high-activity period of 1994. Only two crater-like vents remained, B and C ("A" was gone; BGVN 20:08, 21:08, 21:09, 22:08, and 22:11). Few if any subsequent changes occurred between March 1998 (when the sketch was made) and mid-May 1999; similarly, structural changes were also absent in this interval. Figure 20. Yasur crater (Tanna Island) as it appeared in March 1998; the crater stretches ~ 700 m in the NE-SW direction by ~ 400 m in the NW-SE direction. Labels B and C correspond to named craters. The sketch was made from a photograph; courtesy of Alfréda Mabonlala and IRD. Figure 21. Yasur's two active intracrater vents, B (foreground) and C (farther back), as shot looking to the N in March 1998. The tube in the left foreground holds a filter for collecting samples for Polonium lab analysis. Courtesy of Michel Lardy, IRD. Information Contacts: Michel Lardy, Institut de recherche pour le développement (IRD), P.O. Box 76, Port Vila, Vanuatu; Jeannette Tabbagh, CRG-CNRS,58150 Garchy, France; Douglas Charley, Department of Geology, Mines and Water Resources, PMB 01, Port Vila, Vanuatu. From April 1998 to April 1999 the activity of Yasur remained very low, but in May 1999 there was renewed strong activity. From the beginning of June until mid-July ejecta (with andesitic bombs up to meter size) was thrown to distances up to 600 m from the nearest edge of the crater (figure 22). This long-range dispersal reflected a change in the direction of the eruptive vents. Figure 22. A sketch map of Yasur's crater area showing the limit of bomb impacts (the elliptical cross-hatched line), 15 June - 17 July 1999. Vegetation is shown by stipples (dense) and a lined pattern (scattered). Courtesy of Michel Lardy and Douglas Charley. Original base map by A. Mabonlala, IRD. The explosive activity was greater than at the beginning of 1994. Based on observations made over the past few years (BGVN 24:04), the emissions of intermittent ash associated with the on-going high explosive activity could continue for a period of months. In early June, half-day-long ashfalls accumulating to 3 mm thickness were noted at distances of up to 2 km from the crater, and in July ashfall occurred to the extreme N of the island. The activity remains at Type 2, defined as periods of more explosive activity lasting for weeks or months which result in the ejection of bombs in the area surrounding the crater and minor ashfalls which are distributed by the trade winds to the NW and sometimes towards the central part of the island or to the W coast. During such periods access to the crater edge and its surroundings is prohibited due to the frequent, intense fall of bombs. Information Contacts: Michel Lardy, Institut de Recherche pour le Développment (IRD), P.O.Box 76, Port Vila, Vanuatu; Douglas Charley, Department of Geology, Mines and Water Resources, PMB 01, Port Vila, Vanuatu. Yasur volcano was visited during 18-20 February by John Seach, Geoff Mackley, and a film crew from the United Kingdom. There was a lower level of activity than in June and July 1999 (BGVN 24:07). "Level 1" activity predominated, defined as normal activity where bombs generally fall within the cone area. The three main craters within the cone, A, B, and C, are aligned S to N.
On 18 February Crater A silently emitted small amounts of white vapor tinged with blue. The following day observers saw emission of brown ash but again heard no noise from the crater. Crater B was also silent and only emitted a small amount of white vapor. Two smaller craters E of Craters A and B were continually full of vapor. Crater C exhibited the main activity. There were two active vents at the N and S ends of the crater. The inside crater wall was strongly fumarolic. Over a 2-hour period Crater C produced four explosions from the N vent and three from the S vent. Incandescent bombs were thrown to a height of 120 m. Some bombs glowed for 30 minutes after dark. On 19 February observers lowered themselves 50 m to the floor of the Yasur cone from the SE using ropes. Ground temperature 15 m S of Crater C was 96°C. The floor was littered with black bombs up to 1.5 m in diameter and covered with ash. Explosions threw lava to a height of 250 m. Bombs were either thrown straight up or directed towards the NW edge of the cone. Explosions occurred ten times per hour and were accompanied by ground shaking and sometimes shockwaves. Degassing was heard every few seconds between explosions. Inside the cone a number of earthquakes were felt which were not accompanied by explosions or degassing; these earthquakes were not felt by observers on the crater rim, 100 m away. Inside the cone there was a strong sulfur smell and fumes irritated eyes. On 20 February activity increased. Incandescent lava was ejected every few seconds. Larger explosions about 8 times per hour sent lava to 300 m elevation and 100 m away from the vent. The active vents glowed orange after dark. The NW flanks of Yasur cone down to Lake Siwi were littered with large bombs from the 1999 activity. Black bombs to 3 m in diameter were observed at the base of the cone. Approaching Yasur remains dangerous at any time for visitors. Vehicles can be driven to within 20 m of the cone and this encourages tourists to visit the crater edge. Unpredictable trajectories of bombs and variable eruptive activity pose threats to visitors. It should be noted that three deaths occurred on Yasur in 1994-95 during a period of low activity (BGVN 20:08). Since the end of Yasur's recent very active period during June-November 1999 (BGVN 24:07), volcanic tremor underwent an abrupt drop (figure 23). IRD seismologists define tremor amplitudes at "level 3" for signals 12-60 um and "level 4" for signals over 60 um. As figure 23 shows, the number of tremors at level 3 recorded between January 2000 and November 2001 was ten-times lower than that recorded each year between 1995 and 1998. In that same 22-month period, only a few dozen seismic events of over 60 µm amplitude were recorded (BGVN 24:04). Figure 23. Tremor recorded at Yasur during late January 1993 through November 2001. Bars relate to the left-hand scale and show the yearly number of level 3 events (amplitudes of 12-60 µm). Points connected by lines relate to the right-hand scale and show the yearly number of level 4 events (amplitudes over 60 µm). Asterisks indicate years with incomplete data, as follows: (a) for 1993, only level 3 data were available for the entire year; and (b) the 2001 data shown only extends through 1 November 2001. Courtesy Michel Lardy, Janette Tabbagh, Douglas Charley, and Sandrine Wallez. The eruptive activity observed at vent A, in the southern part of the crater (figures 24, 25, and 26), shifted following a violent event that affected the northern part of the crater at areas B and C in October 1999. Since this event, the explosive activity has remained mild, and limited to vent C, the northernmost vent of the crater. Figure 24. A view of the crater of Yasur on 2 October 1999, taken facing N while on the southern edge. Copyrighted photo courtesy of Michel Lardy, IRD. Figure 25. A view of the crater of Yasur on 9 September 2001, taken facing N while on the southern edge. Copyrighted photo courtesy of Michel Lardy, IRD. Figure 26. A September 2001 visit to Yasur's summit craters with GPS and laser telemetry resulted in this sketch map and N-S cross section. Courtesy of Douglas Charley and Sandrine Wallez (Vanuatu Department of Geology, Mines and Water Resources), and Michel Lardy (IRD). A comparison of photographs taken from the southern crater rim in October 1999 (figure 24) and in September 2001 (figure 25) revealed no profound difference in crater morphology. However, during September 2001 vents A and B were plugged and only vent C was active, with ejecta being sent 170 m above the bottom of the crater. During September 2001, Douglas Charley, Michel Lardy, and Sandrine Wallez undertook a detailed survey of the craters. They used GPS positioning and laser telemetry to produce a map and cross-section showing crater topography and nomenclature (figure 26). Observations on 12 October 2000. Jeff and Raine Williams, sailing aboard the S/Y Gryphon, visited Yasur on 12 October 2000. From ~8 km away a thick plume of steam and smoke could be seen rising from the peak. The route carried the visitors close to the base of the volcano and across the ash plain that stretches for nearly 1.5 km in each direction from the N flank of the mountain. A narrow stream cuts through the plain at its lowest point, and until recently a freshwater lake had filled the lower basin. Heavy rains earlier in the year resulted in the destruction of the lake's natural dam and left eroded ravines. Their guide drove up through the jungle to the steepest part of the unvegetated cinder cone. From there they hiked ~400 m to the crater rim, a ridge with a sheer 90-120 m drop to the crater floor. Only one of the crater pits was active, producing a constant pillar of steam and smoke. Occasionally the wind would blow strong enough to clear the crater floor, allowing views of the lava glow. Every five or ten minutes the volcano would "cough" or "bark" while throwing red-hot cinders hundreds of feet in the air, tracing red arcs back to the sides of the crater where they glowed for several more minutes. One explosion sent ejecta as high as the rim, but away from the observers. As night fell, red light from the crater was illuminating the pit and the rising steam. Information Contacts: Janette Tabbagh, Université Paris VI, UMR 7619, Coordination des recherches Volcanologiques (CRV), 4 Place Jussieu, 75252 Paris Cedex 05, France; Michel Lardy, Institut de Recherche pour le développement (IRD), CRV, BP A 5 Nouméa, Nouvelle Calédonie; Sandrine Wallez and Douglas Charley, Department of Geology, Mines and Water Resources, PMB 01, Port-Vila, Vanuatu; Jeff and Raine Williams, P.O. Box 729, Funkstown, MD 21734, USA. Following 22 months of mild eruptive activity (BGVN 26:11), at the end of October 2001 on-site volcanologists observed the beginning of a more vigorous eruptive phase. The phase's progressive onset was also monitored seismically, which revealed an initial cycle of substantial activity that developed during the first half of December (figure 27). This was followed by a calmer interval, 14-25 December, after which a new burst of activity took place. Figure 27. Seismicity recorded at Yasur during 1 October 2001 through 31 January 2002. Levels 1-5 have been defined by a signal-processing algorithm (see text). The units on the vertical axes are counts at the various levels. The two level-5 events correspond to large tectonic earthquakes. Courtesy of Michel Lardy, IRD. The seismic counts at Yasur (figure 27) can be explained as follows. A geophone is connected to an amplifier that generates signals in response to rapid vertical ground-movements. When the system's output signal (1-20 Hz) crosses a predefined threshold 8 times, the contents of the memory of the counter keyed to that particular threshold are increased by one. For a new count to begin, there has to be an interruption of the signal of at least 2 seconds. The permanent apparatus installed at Yasur for measurement of seismic variation is set to measure across 5 such thresholds, corresponding to an amplitude of just a few micrometers (level 1) to over 300 µm (level 5). The first four thresholds (levels) variously reflect Yasur's state of Strombolian activity. At levels 1 and 2, one can observe hundreds, sometimes thousands, of seismic counts per day. During periods of high activity, paradoxically, one notes a lessening of the number of these counts, either because the counters are saturated, or because the background noise remains above the set threshold. In contrast, level 3, gives a representative idea of the volcano's daily activity: A count in the two-digit range indicates low activity; a daily count in the hundreds indicates high or even very high activity. For level 4, a few counts per day indicates high activity (a status of type 2 on the local hazard map), and when in excess of 10 counts per day, very high activity. Regarding level 5-from the time since recording began in October 1993 to date-only major regional earthquakes have generated such high-amplitude signals. The counts for large earthquakes do not fully represent the assigned momement-magnitudes. That is the case here, for the main shock of the large tectonic earthquake on 2 January (M 7.2) attained fewer counts than the aftershock (M 6.6, figure 27). A visit to the crater area on 31 December revealed that the majority of ash emission and ballistic projectiles were limited to area C (see map in BGVN 26:11) and that a vent of 20-30 m diameter, dormant at the time of earlier visits, had formed in area A (figure 28). Figure 28. A picture taken of the area within Yasur's main crater showing smaller inner craters ("areas") A, B, C, and a new crater, as seen 31 December 2001. Note the small plumes coming from crater C. Copyrighted photo by S. Wallez. Observers witnessed Strombolian eruptions on 29, 30, and 31 December 2001 (figure 29). This activity was accompanied by considerable ash falling in a narrow band over the NE coastal area of the island. Close to a thousand residents suffered the effects of the ashfall, which also negatively impacted subsistence agriculture and the local collection of rainfall as a source of fresh water. Figure 29. Details of an explosion in Yasur's area C on 31 December 2001. This photo is one of a series taken at half-second intervals. Copyrighted photo by S. Wallez. High-magnitude earthquakes. On 2 and 3 January 2002 large tectonic earthquakes struck over 200 km N of Tanna Island (Mw 7.2 and 6.6 respectively). They were felt by the population of Tanna, and recorded by the seismic monitoring station at level 5 (figure 27). Subsequent records showed a considerable weakening of volcanic activity a few days following the earthquake, similar to the pattern observed after the (1-14 December 2001 cycle). It is common for high-magnitude earthquakes (M > 6) near the center of the Vanuatu island group to be felt in Tanna, over 200 km away. To date, after 8 years of continuous monitoring (BGVN 26:11), no connection has been observed between such earthquakes and shifts towards more hazardous behavior at Yasur. Information Contacts: Janette Tabbagh, Université Paris VI, UMR 7619, Coordination des Rechershes Volcanologiques (CRV), 4 Place Jussieu, 75252 Paris Cedex 05, France; Michel Lardy, Institut de Recherche pour le Développement (IRD), CRV, BP A 5 Nouméa, Nouvelle Calédonie; Sandrine Wallez and Douglas Charley, Department of Geology, Mines and Water Resources, PMB 01, Port-Vila, Vanuatu. Eruptive activity has continued at Yasur since a more vigorous phase began in October 2001 that lasted at least into January 2002 (BGVN 27:01). This report includes details for a period of mild activity during 24-28 July 2000 (not previously included in the Bulletin). Since that time visitors noted activity continuing in October 2000 and September 2001 (BGVN 26:11), as well as October and December 2001 (BGVN 27:01). Accounts are provided below of activity during January, August, November, and December 2002. Finally, MODIS thermal-alert data confirm intermittent lower level activity in 2001, and an increase in vigor beginning in August 2002. Observations during July 2000. Roberto Carniel, Douglas Charley, and Marco Fulle arrived on Tanna Island on 24 July 2000 and camped at the base of the E slope of the cone. The lake that used to fill part of the surrounding Ash Plain had disappeared after heavy rains during the rainy season caused the overflow of the lake, damaging several houses in the village of Sulphur Bay. In the active crater, three smaller craters were distinguished, named A, B, and C, from left to right as seen from the E rim, where local guides bring tourists. This spot lies no more than 150 m from the most active C vents (figure 30). During the visit Crater B was slightly active, while Crater A appeared dormant. Figure 30. Photo showing the three subcraters within the active summit crater of Yasur, 24 July 2000. The N end of the island of Tanna and the Pacific Ocean can be seen in the right background. Courtesy of Marco Fulle. On the afternoon of 24 July the activity was moderate to high. Between 1620 and 1640 frequent spattering was observed by Carniel at the C/1 and C/2 vents. Between 1640 and 1820 eight eruptions were observed at vent C/0, with another 10 eruptions at vent C/1. On average the latter vent exhibited the bigger eruptions, in one case accompanied by gray emissions. During the morning of 25 July the activity was again quite intense; observations were sometimes disturbed by a strong wind. Between 0825 and 0910 the explosions were mostly concentrated in the C/0 vent (six eruptions). Some of them were accompanied by the emission of brown ash at the end. During this period three silent explosions with only brown ash emitted were observed at vent B/1, completely inactive the previous day. C/1 showed only one eruption. After 20 minutes with no eruptions, from 0930 to 1130 the activity was mostly concentrated in the C/1 vent, where 17 eruptions were observed, some ended by a brown ash emission. The vent also showed about ten minutes of frequent spattering around 1120; during the same period B/1 vent produced two more silent ash eruptions and a brief spattering was observed at a vent, C/2, that looked different from C/1 but did not show any other activity after this. After 0930 vent C/0 did not show any activity. During the afternoon, new visual observations were made by Carniel. From 1700 to 1725 very low activity was observed. Two successive silent brown ash eruptions from vent B/1 accompanied the start of a more intense phase for vent C/1. This vent erupted 15 times between 1725 and 1855, sometimes also showing continuous spattering and glow. Again no activity was seen at vent C/0. During the morning of 26 July visual observations were made between 0835 and 1125. The first ten minutes were characterized by continuous and loud spattering at vent C/1, which showed a total of 18 explosions, some of them extremely loud and/or accompanied by the emission of gray ash. Vent C/0 showed only three eruptions, but all very loud and followed by a brown ash emission. One single silent ash eruption was observed at vent B/1 at 0945. Carniel made other visual observations between 1700 and 1750 on the afternoon of 26 July, when the activity was characterized by a variable level of continuous spattering from vent C/1, which also showed 10 eruptions. During this period vent C/0 showed a single eruption at 1736. No activity was observed in crater B. After a morning characterized by rain, Carniel and Fulle climbed the volcano again on the afternoon of 27 July. The air was still humid and gas stayed over the craters. The volcano was very quiet between the eruptions, with no sounds and no spattering at any vent. Between 1630 and 1730 there were 14 eruptions observed at vent C/1, but most of them were gas-rich emissions with very few bombs reaching the vent rim. Only two eruptions slightly bigger than spattering were observed at vent C/0. On the morning of 28 July 2000, before leaving the volcano, the team made their last visual observations. Activity was moderate and visibility not very good. Many eruptions were very loud and they could be ascribed to C/1 from the sound alone, even when not visible. At 0920 a rockfall was heard from the S side of the caldera rim. Observations during January 2002. The International Federation of Red Cross and Red Crescent Societies noted on 16 January 2002 that scientists were on alert for heightened volcanic activity at Yasur following a M 7.2 earthquake on 3 January. The earthquake produced landslides in Vanuatu's capital, Port Vila on Efate Island, and damaged buildings and bridges in the city, but there were no deaths or serious injuries. During 5 January to at least 16 January ash fell on Tanna Island, polluting water sources. The week of 6 January the Vanuatu government restricted access to the volcano's crater citing an increased risk of an eruption since the 3 January earthquake. The Volcanic Ash Advisory Center in Wellington notified aviators of an eruption on 25 January around 1300. A pilot reported that the ash cloud rose to ~2 km altitude and slowly drifted S. The ash cloud was not visible on satellite imagery, possibly due to heavy meteorological cloud cover. Observations during August 2002. The European Volcanological Society posted a report from the Institut de Recherche pour le Développement (IRD) on 3 September 2002. At that time the increasing level of activity at Yasur since October 2001 and the M 6 earthquake of 29 August 2002 had prompted IRD to upgrade the hazard status to Alarm Level 3, closing access to the volcano. The earthquake was strongly felt by residents of the entire district around the volcano. This was the first time since the seismic station was installed in October 1992 that a shock of such magnitude was recorded. Elders of the Yasur district confirmed that such an earthquake had not been experienced within living memory. The installation of two new seismological monitoring stations is planned, to complement the existing alarm system installed 2 km from Yasur and the Isangel station. Observations during November 2002. On 22 November 2002 a group of passengers from the Zegrahm Expeditions cruise ship Clipper Odyssey visited the summit area. They observed Strombolian activity from one crater and heard thunderous whooshing sounds followed by thick yellow and white smoke from another. Observations during December 2002. John Seach visited to the volcano on 7 December 2002, approaching by 4WD vehicle across the dry bed of Lake Siwi, which drained in 2000 after a collapse of the natural dam on the N end of the ash plain. Reports from Sulphur Bay village indicated that many houses were destroyed by the flooding. Flowing water from the lake eroded a 5-m-deep section of ground at the location of the dam (figure 31). Figure 31. Erosion channel at the N end of the ash plain at Yasur caused by draining of Lake Siwi. Courtesy of John Seach. Three fumaroles were active on the caldera wall near the parking area at the summit. The crater rim was climbed from the SE and observations made from 1700 to 1930. Yasur showed a high level of activity with up to three vents erupting simultaneously inside the main crater. Eruptions occurred every one or two seconds during the 2.5-hour stay at the summit. Most eruptions were Strombolian with glowing bombs sent up to 150 m above the crater (figure 32). Projectiles generally fell back inside the crater, but the northern-most vent occasionally sent glowing lava bombs over the N and NE crater rims. Mild Vulcanian eruptions occurred at times with ash ejected to 100 m above the crater. Bombs were ejected as either glowing orange blobs of lava or black crusted material. Eruptions were accompanied by loud explosions and ground shaking. Bombs impacting on the ash made a sound like raindrops. Figure 32. Time-lapse nigh photo of a Strombolian eruption from Yasur (southern vent) on 7 December 2002. Courtesy of John Seach. Seismic counts made by the Institute of Research and Development (Noumea) showed an increase in eruptive activity at Yasur in the beginning of December 2002 with Level 3 events increasing from 10 to 40 per hour (see BGVN 27:01 for description of seismic count data). Seismic counts remained elevated until the end of January 2003 when activity reduced to pre-December 2002 levels. MODVOLC Thermal Alerts, 2001-2002. MODIS alerts occurred only three times in 2001 but increased in frequency, size, and alert ratio during 2002 (figure 33). The alerts that occurred in 2001, on 10 March, 4 April, and 31 August, were characterized by a single alert-pixel with very low alert ratio. Ground reports for this period noted mild eruptive activity, with vigorous Strombolian activity beginning in late December 2001 (BGVN 26:11 and 27:01). From 31 January 2002 MODIS indicates quasi-continuous activity throughout the year, which was at its most intense in the two months beginning 29 August 2002 (2210 local time). This followed the M 6 volcanic earthquake at 1500. A map of alert-pixel coordinates places them consistently E of the crater, but this may be a geolocation error rather than being indicative of a new vent. Figure 33. MODIS thermal alerts on Yasur during 2001-2002. Courtesy of Diego Coppola and David Rothery, The Open University. Information Contacts: Roberto Carniel, Università di Udine, Italy (URL: http://www.swisseduc.ch/stromboli/); Douglas Charley, Département de la Géologie, des Mines et des Ressources en eau, Vanuatu; Marco Fulle, Osservatorio Astronomico, Trieste, Italy (URL: http://www.swisseduc.ch/stromboli/); Diego Coppola and David A. Rothery, Department of Earth Sciences, The Open University, Milton Keynes, MK7 6AA, United Kingdom; John Seach, PO Box 16, Chatsworth Island, NSW 2469, Australia (URL: http://www.volcanolive.com/); Jeff and Cynthia Gneiser, Zegrahm & Eco Expeditions, 192 Nickerson Street ##200, Seattle, WA 98109, USA (URL: https://www.zegrahm.com/); International Federation of Red Cross and Red Crescent Societies, PO Box 372, CH-1211 Geneva 19, Switzerland (URL: http://www.ifrc.org/); Wellington Volcanic Ash Advisory Center (VAAC), MetService, PO Box 722, Wellington, New Zealand (URL: http://vaac.metservice.com/); Michel Lardy, Institut de Recherche pour le Développement (IRD), CRV, BP A 5 Nouméa, Nouvelle Calédonie; Société Volcanologique Européenne, C.P. 1, 1211 Geneva 17, Switzerland (URL: http://www.sveurop.org/). Activity from the summit crater at Yasur continued through 2002 (BGVN 28:01). While similar comprehensive reports are not available for 2003, MODIS data (table 2) indicated activity continuing over the year to 16 March 2004. No corroborative reports of activity have been received from the Rabaul Volcano Observatory or the Darwin Volcanic Ash Advisory Centre. Table 2. Nights on which MODIS thermal alerts were recorded for Yasur during the year ending 16 March 2004. Data courtesy HIGP MODIS Thermal Alert System. John Seach reported continued eruptions at Yasur during March 2004. He suggested that there was an average of about 500 explosions per day, which is typical of the volcano's normal state of activity. Information Contacts: HIGP MODIS Thermal Alert System, Hawaii Institute of Geophysics and Planetology, School of Ocean and Earth Science and Technology, University of Hawaii at Manoa (URL: http://modis.higp.hawaii.edu/); John Seach, PO Box 4025, Port Vila, Vanuatu (URL: http://www.volcanolive.com/). Activity consistently identified in MODVOLC thermal alerts through most of 2002 (BGVN 28:01) continued to 4 June 2003, but at lower levels (figure 34). There was usually only one alert pixel on each detection, barely above the detection threshold, with the highest alert ratio of -0.74. After a brief respite, activity was detected several times during 17 September through October 2003. No subsequent activity was detected until 15 March, 10 April, and 28 May 2004. These three alerts each triggered one alert pixel and had low alert ratios, about -0.8, just above the detection threshold. It seems likely that activity continued throughout the period, but was below the MODVOLC threshold most of the time and did not trigger an alert. There were no other reports of activity for this period. Figure 34. MODIS thermal alerts from Yasur for 1 January 2001-31 May 2004. Thermal alerts collated by Charlotte Saunders and David Rothery; data courtesy of the Hawaii Institute of Geophysics and Planetology's MODIS thermal alert team. At the end of June 2004, Yasur volcano started a new cycle of high activity, the fifth since continuous monitoring began in 1993. This cycle is expected to last several months. Having reached a climax in 2002, a lessening of activity had been observed throughout 2003. A return of elevated activity was noted in March 2004, heralding the cycle that began toward the end of June (figure 35). The bulk of the seismic record (over 95%) measured by a station located 2 km from the crated represented vertical ground-movement greater than 60 mm. The increase-decrease cycle is clearly visible. Unfortunately, problems with the power supply of the station's transmitter interrupted the flow of data at the time of onset of high activity. Figure 35. Evolution of activity seen and measured at Yasur volcano from 1 January 2003 to 21 July 2004. The horizontal scale uses the convention of day, month, and year; the vertical scale shows upward increasing 'level 3' seismicity, which is defined as ground displacements of over 12.4 micrometers (µm). The histogram bars were based on seismic measurements recorded by a station located 2 km from the crater and transmitted via the satellites of the Argos system. The text explains various aspects of the data and volcanism. Courtesy of Michel Lardy and Philipson Bani, IRD. The new cycle of high activity that began in late June 2004 was accompanied by ash ejection. Ash fall reached several millimeters in thickness at distances up to 4 km from the vents. The cycle was linked to the reopening of the three main channels feeding vents A, B, and C, and the consequent re-emergence of emissions at all three vents. Fieldwork was conducted on Tanna Island during 10-15 July 2004. Vent A exhibited large ash plumes and low-intensity explosions (figures 36 and 37), with lava bombs ejected toward an area NW of the crater. Strombolian activity was observed at vent B (figure 38). This was the most explosive of the vents, with lava bombs projected vertically more than 300 m above the crater rim. The plume's bluish color was quite visible, confirming the presence of SO2. A wall of scoria at vent C, present now for several years, separates this vent from vents A and B. Lava ejections from vent C did not extend beyond the lip of the vent. Very dense ash plumes were emitted, but their intensity decreased after 10-11 July. From 11 to 15 July, the scientists measured SO2 concentration using a Mini Doas spectrometer and calculated a daily output of SO2 of around 1,000 metric tons per day, twice the amount measured in April 2004. Figure 36. An overview of Yasur's crater on 11 July 2004. Vents are labeled and show typical activity seen during the visit. Copyrighted photo credited to M. Lardy, IRD. Figure 37. Yasur's vent A in the midst of a dense emission of bombs and ash. A light- colored plume sits over vent C (to the right and in the background). The shot was taken during the fieldwork of 10-15 July 2004. Copyrighted photo credited to M. Lardy, IRD. Figure 38. Yasur's vents B (in front), showing blueish emissions, as well as vent C (farthest back), emitting a taller, dense plume. The shot was taken during the fieldwork of 10-15 July 2004. Copyrighted photo credited to P. Bani, IRD. Information Contacts: Michel Lardy and Philipson Bani, IRD (Institut de Recherche pour le Développement) UMR Magmas et Volcans, BP A5 98848 Nouméa Cedex, New Caledonia; Jeanne Tabbagh, DGA (Département de Géophysique Appliquée), Université Paris VI, 4 Place Jussieu 75252, Paris Cedex 05, France; Esline Garaebiti, Department of Geology, Mines and Water Resources (DGMWR), PMB 01, Port- Vila, Vanuatu. Yasur has a record of at least several hundred years of near-constant eruptions from several vents. A period of increased activity in June 2004 (BGVN 29:07) included Strombolian behavior, low intensity explosions with lava bombs, dense ash plumes, and elevated SO2 levels. Located on Tanna Island (figure 39), this volcano is a major tourist attraction due to an access road to an overlook point (figure 40). Regular activity has continued since mid-2004 through mid-2010. MODVOLC alerts based on infrared imagery detected by satellite have occurred in every month since the previous report in 2004. Figure 39. Maps indicating the locations of the nation of Vanuatu, Tanna Island, and Yasur volcano. Courtesy of Agence France-Presse. Figure 40. Web map of Yasur volcano in July 2010 showing the prohibited zone, the parking lot and other features. Courtesy of Vanuatu Geohazards Observatory (VGO). Although scientific reports have not been available, visitors to the volcano often post photographs on internet sites. For example, a quick review of Flickr images showed Strombolian ejections from multiple vents, and small ash explosions, that were taken in November 2005, May, September, and December 2006, January and September 2007, May, June, August, and September 2008. Similar activity was documented during March, May, June, and July 2009. An aerial photograph taken on 12 June 2009 showed a mostly white plume rising just above the summit (figure 41). Figure 41. Photograph showing a plume from Yasur being blown downwind on 12 June 2009. The plume appears mostly white, with some possible ash. The day is overcast with darker rain clouds overhead. Courtesy of PhillipC (Creative Commons license). During January 2010 activity began to increase. A report from the Wellington Volcanic Ash Advisory Centre (VAAC) noted that on 11 January 2009 a plume had risen to an altitude of 4 km and drifted SE. Volcanic ash was not identifiable from satellite data. On 21 January, OMI satellite images indicated a significant increase in sulfur dioxide gas emissions (at least 2,000 metric tons/day). According to the Vanuatu Geohazards Observatory (VGO), during the first week of March 2010 bombs were ejected. Observations on 8 March and analyses of seismic data both indicated increased emissions at all three vents. According to VGO, Yasur maintained its high activity during April and most of May 2010, with strong degassing and ash emissions from all three active vents. Ash fell on most parts of the island. Fresh volcanic bombs fell around the crater rim, and a few reached the ash plain and the parking area. A photo showed an elongate, ~ 1.5-m-long bomb that fell on 23 April lying on the ash plain. Explosions could be heard and viewed from nearby villages. OMI satellite data did not disclose elevated SO2 levels on 9 May 2010. Activity increased again in late May; according to VGO, activity included moderate-to-large eruptions with strong explosions, ejected bombs that fell on the visitor viewing area, and significant ashfall in nearby villages. Visitors were not allowed to approach within about 500 m of the volcano. According to the Wellington VAAC, ash plumes rose to an altitude of 1.8 km every day between 29 May and 10 June 2010. Volcanic ash was not identifiable from satellite data except for 30 and 31 May. According to a news article, the plume on 1 June spread over 340 km2, canceling or delaying some flights in and out of New Caledonia (~ 430 km WSW). In early June, activity decreased. Explosions became less frequent, but Strombolian activity continued with occasional ejections of lava bombs. Heightened activity recurred in early July 2010. The VGO noted strong degassing and ash emissions from all the three active vents. Ashfall primarily occurred over the western portion of the island and fresh volcanic bombs fell around the crater rim. Some explosions could be heard and viewed from nearby villages. Visitor photos showed continuing Strombolian activity at the vents on 26 July and 7 August 2010. Information Contacts: Vanuatu Geohazards Observatory, Geo-Hazard Section, Department of Geology, Mines and Water Resources, PMB 01, Port Vila, Vanuatu (URL: http://www.vmgd.gov.vu/vmgd/); Wellington Volcanic Ash Advisory Centre (VAAC), Meteorological Service of New Zealand Ltd (MetService), PO Box 722, Wellington, New Zealand (URL: http://www.metservice.com/vaac/, http://vaac.metservice.com/); Hawai'i Institute of Geophysics and Planetology (HIGP) Thermal Alerts System, School of Ocean and Earth Science and Technology (SOEST), Univ. of Hawai'i, 2525 Correa Road, Honolulu, HI 96822, USA (URL: http://modis.higp.hawaii.edu/); Flickr.com (Photographer: PhillipC, http://www.flickr.com/photos/flissphil/); Agence France-Presse (URL: http://www.afp.com/); Radio New Zealand International (URL: http://www.rnzi.com/). On 12 May 2011, Yasur's crater (figure 42), which has undergone near-continuous eruption for over 200 (possibly 800) years, emitted persistent strong explosions that could be heard and felt by nearby residents. Satellite images (OMI and MODIS) and seismic data collected from the volcano's monitoring station also confirmed strong degassing and stronger than typical explosive activity since the beginning of May 2011. The volcano sits on Tanna Island in the island nation called the Republic of Vanuatu (formerly New Hebrides; ~2,200 km N off of New Zealand's coast and ~2,100 km NE off of Australia's coast). As seen on the map in the Gaua report in this issue (BGVN 36:05), Tanna island lies near the S end of the Republic. Figure 42 presents information about Vanuatu's tectonic setting and Yasur volcano's location and shape. Figure 42. (a) Map showing the Vanuatu arc in the SW Pacific, the position of the 6-7 km deep Vanuatu trench, convergence rates (indicated by arrows in cm/yr), and the location of Tanna volcanic island, which rises from a 1-km-deep plateau (redrawn from Pelletier and others, 1998 and Calmant and others, 2003). (b) Schematic map of Tanna island with the locations of the main volcanic centers (redrawn from Carney and MacFarlane, 1979). In its long dimension (N-S), Tanna island stretches ~40 km; its width is ~19 km. (c) Map of southeastern Tanna showing the Yasur crater and Yenkahe horst, bounded by the Siwi ring fracture (redrawn from Nairn and others, 1988 and Allen, 2005). From Métrich and others (2011). An assessment conducted by the Vanuatu Geohazards Observatory (VGO) during 30 May-3 June 2011 found Yasur's crater in a state of high activity with strong explosions and bomb emissions from all of the three active vents. Fresh volcanic bombs fell around the crater rim, and some reached ~500 m S to the parking area, landing there about once per minute. Residents heard and viewed explosions from their villages. Observations and assessments made by VGO during 11-12 June 2011 indicated a decrease in eruptive vigor and a return to more typical conditions. Explosions became both slightly weaker and less frequent. Constant Strombolian activity with occasional ejections of lava bombs still occured around the volcano. On 7-8 July 2011 the VGO reported that Yasur volcano was at a high level of activity with strong degassing and ash emissions from all three active vents. The ash falls were mostly over the W part of the island. Fresh volcanic bombs had fallen around the crater rim. Some explosions could be heard and viewed from the villages, a pattern locals had noticed since the beginning of the year. Hazard terminology and levels. The operative hazards scale for Yasur spans from 0 to 4, with larger values indicating greater hazards. It is called the VVAL (Vanuatu Volcano Alert Level). Level 2 is defined as "Moderate eruptions, danger close to the volcano vent, within parts of Volcanic Hazards Map Red Zone" (see map in BGVN 35:04). Level 3 is defined as "Large eruption, danger in specific areas within parts of Volcanic Hazards Map Red and Yellow Zones." In the early phases of the upsurge in vigor, the VVAL for Yasur remained at Level 2 with the note that the risk area for volcanic projectiles remained in areas near the volcano crater and vicinity. Associated with the assessed late-May to early June behavior, the VVAL stepped up to Level 3. A zone surrounding the summit became strictly prohibited (see visitor's map, BGVN 35:04). Associated with the 11-12 June 2011 observations of decreasing vigor, the VVAL dropped to Level 2. Background. Métrich and others (2011) point out that Siwi caldera is a volcanic complex containing both persistent eruptive activity of basaltic-trachyandesite composition (Yasur volcano) and rapid block resurgence (Yenkahe horst). They note that available data suggested that Yasur volcano releases, on average, over 134 x 103 tons/day of H2O and 680 tons/day of SO2. Measurements also indicated other gas fluxes: 840 tons/day of CO2, 165 tons/day of HCl, and 23 tons/day of HF. References. Allen, S.R., 2005, Complex spatter- and pumice-rich pyroclastic deposits from an andesitic caldera forming eruption: The Siwi pyroclastic sequence, Tanna, Vanuatu, Bulletin of Volcanology, v. 67, pp. 27-41. Calmant, S., Pelletier, B., Lebellegard, P., Bevis, M., Taylor, F.W., and Phillips, D.A., 2003, New insights on the tectonics along the New Hebrides subduction zone based on GPS results, Journal of Geophysical Research, v. 108, no. B6, pp. 2319-2339. Carnay, JN., and MacFarlane, A, 1979, Geology of Tanna, Aneityum, Futuna and Aniva, New Hebrides Geological Survey Report 1979, pp. 5-29. Métrich, N., Allard, P., Aiuppa, A., Bani, P., Bertagnini, A., Shinohara, H., Parello, F., Di Muro, A., Garaebiti, E., Belhadj, O., and Massare, D., 2011, Magma and Volatile Supply to Post-collapse Volcanism and Block Resurgence in Siwi Caldera (Tanna Island, Vanuatu Arc), Journal of Petrology, v. 52, no. 6, pp. 1077-1105; DOI: 10.1093/petrology/egr019. Nairn, I.A., Scott, B.J., and Giggenbach, W.F., Yasur volcanic investigations, Vanuatu September 1988, New Zealand Geological Survey Report 1988, pp.1-74. Pelletier, B., Calmant, S., and Pillet, R., 1998, Current tectonic of the Tonga-New Hebrides region, Earth and Planetary Science Letters, v. 164, pp. 263-276. Information Contacts: Vanuatu Geohazards Observatory, Department of Geology, Mines and Water Resources of Vanuatu (URL: http://www.geohazards.gov.vu); NASA Earth Observatory (URL: http://earthobservatory.nasa.gov/); MODIS/MODVOLC Thermal Alerts System, Hawai'i Institute of Geophysics and Planetology (HIGP), School of Ocean and Earth Science and Technology (SOEST), Univ. of Hawai'i, 2525 Correa Road, Honolulu, HI 96822, USA (URL: http://modis.higp.hawaii.edu/); Wellington Volcanic Ash Advisory Centre (VAAC), Meteorological Service of New Zealand Ltd (MetService), PO Box 722, Wellington, New Zealand (URL: http://www.metservice.com/vaac/, http://vaac.metservice.com/). In BGVN 36:05, we reported that on 12 May 2011, the Vanuatu Geohazards Observatory (VGO) reported, based on information collected by the Vanuatu Meteorology and Geohazards Department, that a OMI (ozone monitoring instrument) satellite image showed strong degassing of SO2 from Yasur volcano during the previous week (see map of this island volcano in figure 42 of BGVN 36:05). On 1 June 2011, the Vanuatu Volcano Alert Level (VVAL) was raised from 2 to 3, following increasing explosive activity during May, then lowered to 2 on 13 June (table 3). Table 3. The Vanuatu Volcanic Alert Level (VVAL) scale for the six volcanoes monitored by Vanuato Geohazard Observatory (Yasur, Lopevi, Ambrym, Aoba, Gaua, and Suretamatai). Courtesy of Vanuatu Geohazards Observatory. Lvl. ? Insufficient monitoring to make assessment. Lvl. 0 Normal low-level activity. Lvl. 1 Increased activity, danger near crater only. Lvl. 2 Moderate eruptions, danger close to the volcano vent, within parts of Volcanic Hazards Map Red Zone. Lvl. 3 Large eruption, danger in specific areas within parts of Volcanic Hazards Map Red and Yellow Zones. Lvl. 4 Very large eruption, island-wide danger (including areas within Red Yellow and Green Zones). During the week of 7-12 July 2012, VGO observed that explosive activity at Yasur became stronger and more frequent, and shifted from Strombolian to sub Plinian. Bombs ejected from the vents fell in the crater, around the summit area, and on the tourist walk and parking area (within the red zone, figure 43). The explosions were heard, felt, and observed from nearby villages and schools. Activity at all three volcanic vents was characterized by degassing, ash emissions, and ejection of bombs. On 13 July 2012, the Alert Level was raised to 3. 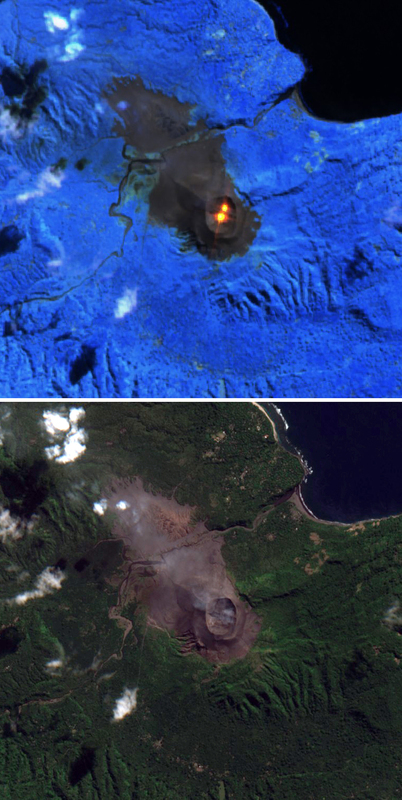 VGO reported an OMI satellite image on 1 April 2013 showed diffuse SO2 from Yasur. Explosive activity increased on 2 April 2013, with explosions becoming stronger and more frequent, and continued to slightly increase through 28 May. Bombs again fell around the summit area, the tourist walk, and the parking area. Moderate ash emissions and ashfall occurred on 2, 4, and 5 April, and 5 and 8 May 2013. Photos included in the report showed dense white plumes on 23 and 24 May. The Alert Level remained at 2 (on a scale of 0 4). Volcano Ash Advisory Centre (VAAC) reports on Yasur. In many cases the VAAC lacked any satellite data and in cases where they did have data they frequently were unable to detect the plume or in other cases could not detect ash in the plume (table 4). Table 4. Yasur volcano aviation reports (VAAs, Volcanic Ash Advisories) for the time interval 11 January 2009 to 10 June 2010. In many cases the information sources were the Vanuatu Geohazard Observatory (VGO). On 11 January the source was an AIREP, an aircraft report. Data provided courtesy of the Wellington Volcanic Ash Advisor Centre (VAAC). Satellite Thermal Alerts. The MODIS/MODVOLC satellite thermal alert system has shown least 1 to 10 alerts each month over Yasur since the beginning of 2011. A lava lake has existed at Yasur for many years. References. Allen, S.R., 2005, Complex spatter and pumice rich pyroclastic deposits from an andesitic caldera forming eruption:The Siwi pyroclastic sequence, Tanna, Vanuatu, Bulletin of Volcanology, v. 67, pp. 27 41. Calmant, S., Pelletier, B., Lebellegard, P., Bevis, M., Taylor, F.W., and Phillips, D.A., 2003, New insights on the tectonics along the New Hebrides subduction zone based on GPS results, Journal of Geophysical Research, v. 108, no. B6, pp. 2319 2339. Carnay, JN., and MacFarlane, A, 1979, Geology of Tanna, Aneityum, Futuna and Aniva, New Hebrides Geological Survey Report 1979, pp. 5 29. Métrich, N., Allard, P., Aiuppa, A., Bani, P., Bertagnini, A., Shinohara, H., Parello, F., Di Muro, A., Garaebiti, E., Belhadj, O., and Massare, D., 2011, Magma and Volatile Supply to Post collapse Volcanism and Block Resurgence in Siwi Caldera (Tanna Island, Vanuatu Arc), Journal of Petrology, v. 52, no. 6, pp. 1077 1105; DOI: 10.1093/petrology/egr019. Nairn, I.A., Scott, B.J., and Giggenbach, W.F., 1988, Yasur volcanic investigations, Vanuatu September 1988, New Zealand Geological Survey Report 1988, pp.1 74. Pelletier, B., Calmant, S., and Pillet, R., 1998, Current tectonic of the Tonga New Hebrides region, Earth and Planetary Science Letters, v. 164, pp. 263 276. Information Contacts: Vanuatu Geohazards Observatory, Department of Geology, Mines and Water Resources of Vanuatu (URL: http://www.geohazards.gov.vu); NASA Earth Observatory (URL: http://earthobservatory.nasa.gov); MODIS/MODVOLC Thermal Alerts System, Hawai'i Institute of Geophysics and Planetology (HIGP), School of Ocean and Earth Science and Technology (SOEST), Univ. of Hawai'i, 2525 Correa Road, Honolulu, HI 96822, USA (URL: http://modis.higp.hawaii.edu/); and Wellington Volcanic Ash Advisory Centre (VAAC), Meteorological Service of New Zealand Ltd (MetService), PO Box 722, Wellington, New Zealand (URL: http://www.metservice.com/vaac/, URL: http://vaac.metservice.com/). Our previous report from May 2013 (BGVN 38:05) noted Strombolian activity, including volcanic bombs in July 2012 and ashfall and volcanic bombs in April and May 2013. The Vanuatu Geohazards Observatory (VGO) bulletin from 28 May 2013 noted that Yasur's explosive activity had increased slightly, compared to the recent past. The activity included Strombolian explosions (figure 43) and ash and steam plumes. This report discusses activity from June 2013 through February 2014, along with photographs taken in May 2013. A map of Vanuatu and nearby countries was provided in BGVN 35:06. Figure 43. Strombolian activity from Yasur recorded during May 2013. Courtesy of Volcano Discovery (Dietmar Berendes). Observations and seismic data from early to mid-August 2013 suggested that explosive activity of the volcano had decreased slightly during that time. Explosions were weaker and less frequent. Therefore, on 29 August 2013, the VGO decreased the Alert Level from 2, where it had been since early April 2013, to 1. Level 1 (on a scale of 0-4) indicates "increased activity [but] danger near crater only". From 29 August 2013 until at least February 2014, the Alert Level has remained at 1. Hazard zones at Yasur are indicated in figure 44. VGO has warned visitors that ejected volcanic bombs could hit the summit area, the tourist walk, and parking area. Figure 44. This danger map ('Denja Map') of Tanna Island containing Yasur volcano shows Red, Yellow, and Green zones to warn visitors and civilians of ashfall and other hazards. Yasur volcano is near the eastern end of the red, highest-risk zone. Map key and title are in a language with phonetic similarities to English that evolved with contact from traders (a lingua franca) but many other languages also remain in use in Vanuatu. Ash could likely fall well W of Yasur due to trade winds from the ESE. This image is of low to moderate resolution and some symbols are illegible. Courtesy of Vanuatu Geohazards Observatory. According to John Search, who has led tours of the volcano since 1998, activity increased beginning October 2013. A large ash emission caused widespread damage to vegetation on Tanna Island, and ashfall was reported on Erromango Island, 150 km N of Yasur. On the evening of 3 November 2013, Search witnessed large Strombolian explosions. These explosions ejected volcanic bombs, up to 4 m in diameter, 250 m from the vent, putting visitors at risk. According to Search, the explosions were some of the largest at Yasur since 1995. On 19 November 2013, VGO reported that a new phase of ash emissions began on 3 November. The explosive intensity remained low. Information Contacts: Vanuatu Geohazards Observatory, Department of Geology, Mines and Water Resources of Vanuatu (URL: http://www.geohazards.gov.vu); John Seach, Volcanolive.com (URL: Volcanolive.com/Yasur.html); and Volcano Discovery (www.volcanodiscovery.com). A previous report on Yasur (also called Tanna) from November 2013 (BGVN 38:11) noted weak explosions with ash and steam emissions during several months of 2013. This report discusses activity from December 2013 through October 2016. No reports about Yasur from the Vanuatu Geohazards Observatory (VGO) for 2014 are known. 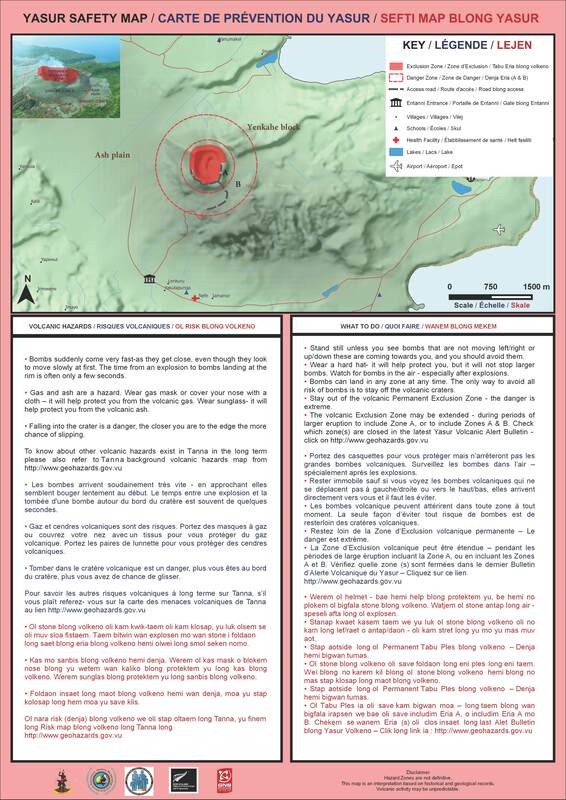 A report from VGO on 27 April 2015 noted that the volcano continued in a state of unrest, and the Alert Level remained at 1 (on a scale of 0-4). VGO reminded residents and tourists that areas near the crater and areas prone to ash and gas as carried by the trade winds should be avoided. On 13 November VGO reported that activity had increased, with more intense explosions. The Alert Level was raised to 2. On 15 December 2015, VGO again reported that explosions had become more intense. On 14 January 2016 VGO reported that explosions had become more intense, but the baseline level or previous reference day for that evaluation was not specified. Tour operator John Seach (Volcano Live), who makes frequent trips to the summit craters, described the continuing eruption in January 2016 as mildly Strombolian. VGO noted that explosions remained intense in reports from 31 March, 27 May, 28 June, 2 August, 9 September, and 10 October 2016. 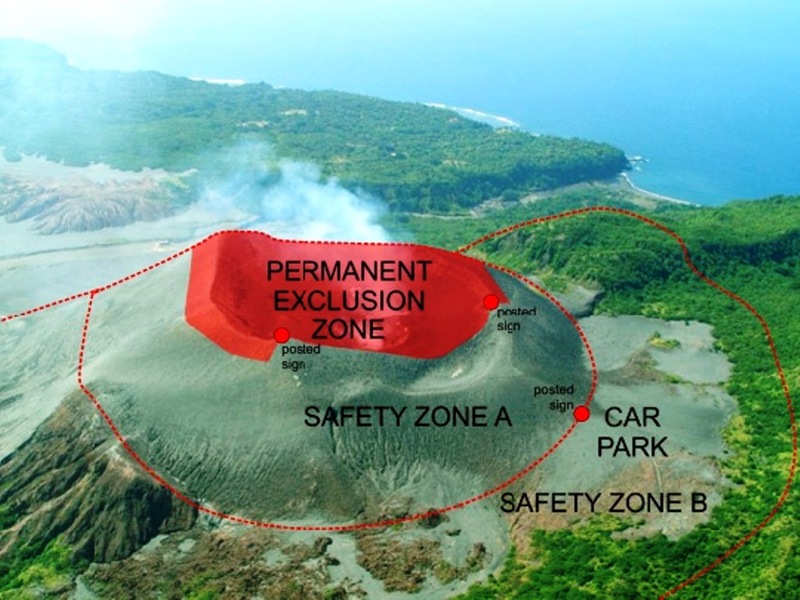 VGO reminded residents and tourists to avoid the permanent Exclusion Zone within 600 m of the crater (figure 45); the Alert Level remained at 2. Figure 45. Yasur Safety Map showing the hazard zones and nearby infrastructure. Courtesy of the Vanuatu Geohazards Observatory. MODIS/MODVOLC thermal anomalies were numerous during the reporting period, with at least one every month. The MIROVA (Middle InfraRed Observation of Volcanic Activity) volcano hotspot detection system, also based on analysis of MODIS data, detected almost continuous anomalies during October 2015-September 2016; the radiative power of the hotspots were all in the low or moderate range. Information Contacts: Vanuatu Geohazards Observatory (VGO), Department of Geology, Mines and Water Resources of Vanuatu (URL: http://www.vmgd.gov.vu/vmgd/); John Seach, Volcano Live (URL: http://volcanolive.com/index.html); Hawai'i Institute of Geophysics and Planetology (HIGP) MODVOLC Thermal Alerts System, School of Ocean and Earth Science and Technology (SOEST), Univ. of Hawai'i, 2525 Correa Road, Honolulu, HI 96822, USA (URL: 2/12/2016http://modis.higp.hawaii.edu/); MIROVA (Middle InfraRed Observation of Volcanic Activity), a collaborative project between the Universities of Turin and Florence (Italy) supported by the Centre for Volcanic Risk of the Italian Civil Protection Department (URL: http://www.mirovaweb.it/). The almost continuous eruption at Yasur, possibly over the previous 800 years, remained active through October 2016 (BGVN 41:12). The Vanuatu Geohazards Observatory (VGO) has maintained the hazards status at Volcano Alert Level 2 (major unrest - danger around the crater rim and specific area, notable/large unrest, considerable possibility of eruption and also chance of flank eruption) through mid-June 2017. Volcano Alert Bulletins posted by the VGO on 19 April, 22 May, and 22 June 2017 indicated ongoing strong explosive activity. Satellite-detected MODIS thermal anomalies identified by MODVOLC were numerous during the reporting period, with at least one every month except during November 2016. The MIROVA system also detected nearly continuous thermal anomalies during the year ending on 12 June 2017 (figure 46), though activity decreased in the last few months of 2016 and was somewhat more intermittent in the first half of 2017 compared to July-September 2016. Figure 46. Thermal anomalies detected in MODIS data by the MIROVA system (log radiative power) at Yasur for the year ending 12 June 2017. Courtesy of MIROVA. Information Contacts: Vanuatu Geohazards Observatory, Department of Geology, Mines and Water Resources of Vanuatu (URL: http://www.vmgd.gov.vu/vmgd/, http://www.vmgd.gov.vu/vmgd/index.php/geohazards/volcano); Hawai'i Institute of Geophysics and Planetology (HIGP) - MODVOLC Thermal Alerts System, School of Ocean and Earth Science and Technology (SOEST), Univ. of Hawai'i, 2525 Correa Road, Honolulu, HI 96822, USA (URL: http://modis.higp.hawaii.edu/); MIROVA (Middle InfraRed Observation of Volcanic Activity), a collaborative project between the Universities of Turin and Florence (Italy) supported by the Centre for Volcanic Risk of the Italian Civil Protection Department (URL: http://www.mirovaweb.it/). Regular monitoring reports about Yasur from the Vanuatu Meteorology and Geo-Hazards Department (VMGD) indicated that the centuries-long eruptive activity continued from mid-June 2017 through January 2018. VMGD volcano bulletins on 21 July, 30 August, 29 September, 31 October, and 8 December 2017, and 30 January 2018, stated that major unrest was continuing, and the Alert Level remained at 2 (on a scale of 0-4). Based on seismic data, explosions continued to be intense. Visitors were reminded of the closed 395-m-radius Permanent Exclusion Zone (figure 47) and that volcanic ash and gas could impact other areas near the volcano due to trade winds. Figure 47. Oblique aerial photograph of Yasur with an overlay of designated hazard zones that may be closed depending on the level of eruptive activity. Courtesy of Vanuatu Meteorology and Geo-Hazards Department. During the reporting period thermal anomalies based on MODIS satellite instruments analyzed using the MODVOLC algorithm were numerous every month. The MIROVA (Middle InfraRed Observation of Volcanic Activity) system also detected numerous hotspots every month (figure 48). Figure 48. Thermal anomalies detected in MODIS data by the MIROVA system (log radiative power) at Yasur for the year ending 23 February 2018. Courtesy of MIROVA. Information Contacts: Geo-Hazards Division, Vanuatu Meteorology and Geo-Hazards Department, Ministry of Climate Change Adaptation, Meteorology, Geo-Hazards, Energy, Environment and Disaster Management, Private Mail Bag 9054, Lini Highway, Port Vila, Vanuatu (URL: http://www.vmgd.gov.vu/, https://www.facebook.com/VanuatuGeohazardsObservatory/); Radio New Zealand (URL: https://www.radionz.co.nz); Hawai'i Institute of Geophysics and Planetology (HIGP) - MODVOLC Thermal Alerts System, School of Ocean and Earth Science and Technology (SOEST), Univ. of Hawai'i, 2525 Correa Road, Honolulu, HI 96822, USA (URL: http://modis.higp.hawaii.edu/); MIROVA (Middle InfraRed Observation of Volcanic Activity), a collaborative project between the Universities of Turin and Florence (Italy) supported by the Centre for Volcanic Risk of the Italian Civil Protection Department (URL: http://www.mirovaweb.it/). Yasur, the best-known and most frequently visited of the Vanuatu volcanoes, has been in more-or-less continuous Strombolian and Vulcanian activity since Captain Cook observed ash eruptions in 1774. This style of activity may have continued for the past 800 years. Located at the SE tip of Tanna Island, this mostly unvegetated pyroclastic cone has a nearly circular, 400-m-wide summit crater. The active cone is largely contained within the small Yenkahe caldera, and is the youngest of a group of Holocene volcanic centers constructed over the down-dropped NE flank of the Pleistocene Tukosmeru volcano. The Yenkahe horst is located within the Siwi ring fracture, a 4-km-wide, horseshoe-shaped caldera associated with eruption of the andesitic Siwi pyroclastic sequence. Active tectonism along the Yenkahe horst accompanying eruptions has raised Port Resolution harbor more than 20 m during the past century. Allen S R, 2005. Complex spatter- and pumice-rich pyroclastic deposits from an andesitic caldera-forming eruption: the Siwi pyroclastic sequence, Tanna, Vanuatu. Bull Volcanol, 67: 27-41. Carney J N, Macfarlane A, 1979. Geology of Tanna, Aneityum, Futuna and Aniwa. New Hebrides Geol Surv Reg Rpt, 81 p.
New Hebrides Geological Survey, 1978. Geology of Tanna, Aneityum, Futuna and Aniwa. New Hebrides Geol Surv, 1:100,000 geol map sheet 11. Robin C, Eissen J-P, Monzier M, 1994. Ignimbrites of basaltic andesite and andesite composition from Tanna, New Hebrides Arc. Bull Volcanol, 56: 10-22. There is no Deformation History data available for Yasur. There is no Emissions History data available for Yasur. Incandescent spatter is ejected from a vent on the floor of the summit crater of Yasur volcano on September 8, 1988. The volcano has displayed continuous strombolian or vulcanian activity since it was seen by Captain Cook in 1774. The mild activity seen here is occasionally interrupted by more violent explosive activity, such as occurred in 1878, 1968, 1972, 1974-75, and 1977. Photo by Ian Nairn, 1988 (New Zealand Geological Survey). A column of steam rises above the summit crater of Yasur volcano, seen here from the west across Lake Siwi in 1988. Yasur, the best-known and most frequently visited of the Vanuatu volcanoes, has been in more-or-less continuous strombolian activity since Captain Cook observed ash eruptions in 1774. This style of activity may have continued for the past 800 years. The mostly unvegetated 361-m-high pyroclastic cone is capped by a nearly circular, 400-m-wide summit crater. Photo by Ian Nairn, 1988 (New Zeland Geological Survey). Large Eruptions of Yasur Information about large Quaternary eruptions (VEI >= 4) is cataloged in the Large Magnitude Explosive Volcanic Eruptions (LaMEVE) database of the Volcano Global Risk Identification and Analysis Project (VOGRIPA).